With a wide range of car hire services available at Bari Airport, arranging transport for your trip to Italy is made simple with Sixt. Choose from a range of car categories such as economy, luxury, 4x4s and minivans. With our great deals on extras such as Sat Nav, baby seats and additional insurance options, you can be sure that your every need is met, whatever your reasons for visiting Italy are. Book your car rental online for the utmost of convenience, and have your vehicle waiting for you when you arrive at Bari Airport. Bari airport, also known as Bari Karol Wojtyla Airport (BRI), is located approximately 5 miles north of Bari, in the southern Italian region of Puglia. When you reach the airport you will find our Sixt branch located within the arrivals hall. Located on the Adriatic Coast, Bari makes an ideal base for exploring all that the Puglia region has to offer. In the old town of Bari, you will find a number of historical buildings such as the Basilica di San Nicola, an 11th century Romanesque church. Other prominent attractions include the old port, Porto Vecchio, and the Piazza del Ferrarese. If you would like to soak up some culture head to the city's art gallery, Pinacoteca Provinciale Corrado Giaquinto. To make the most of your car hire experience, head inland to the Alta Murgia National Park, or take your car rental north along the SS16, and stop at the seaside towns of Molfetta and Trani, which boast spectacular views over the Adriatic Sea. 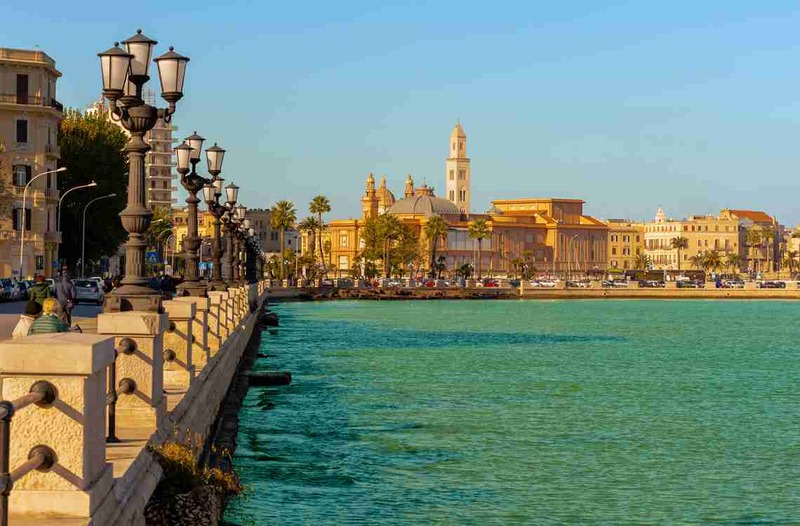 Alternatively, drive south on the A14 after leaving the airport until you reach Taranto, a beautiful historic harbour town with incredibly azure beaches. Next time you are in Bari, go for car rental with Sixt at Bari Airport and enjoy an unforgettable journey through the south of Italy. You will receive your rental car at the Sixt branch, which is located in the car rental area within the arrival hall, in front of the arrival exit. Exit the terminal pass parking P2 and you will find the Sixt parking spaces. Follow Viale Europa towards Bari Airport, then turn right in via Gabriele D'Annunzio and make a left on Viale Enzo Ferrari. Proceed straight until you reach the airport. You can reach the airport from the city center by Metro or by train (FR2, every 40 minutes from Bari Central station). When you arrive at the airport, in order to return the vehicle, please follow via Enzo Ferrari, follow directions to Car Rental Return. At the roundabout take the 2nd exit and turn right, after 50 m you will find our parking on your left. Enter the Parking and leave the car in one of our Sixt spaces.